The classic Golden Rule with Praying Children was one of our most popular designs for a decade, but it left out Hinduism, so we replaced it with two other Golden Rule designs. Now it is back with all six of the major religions represented, and an updated timeline on the back. 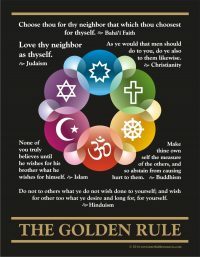 This new version includes a version of the Golden Rule as expressed in the scriptures of - Judaism, Christianity, Islam, Hinduism, Buddhism and the Baha'i Faith. 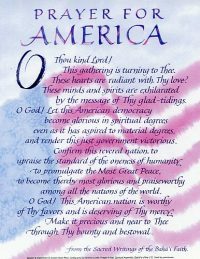 This is a letter-sized print with a short pamphlet called "Racial Harmony: The Key to America's Spiritual Destiny" on the back. These are perfect for giving out at fairs and 4th of July events. Parents will love these for their children's rooms. Give them away at children's classes, family festivals, "safe nights," fairs and educational gatherings. The front has a charming image of six diverse children. It is a hand-painted black & white photograph by David Bliwas, which is reminiscent of the ones in our new Blessings and Gems prayer book. At the bottom is the children's prayer that begins "O Thou kind Lord! These lovely children are the handiwork of the fingers of Thy might...."
This is something women will want to take home with them. It can be given out at fairs, at businesswomen's meetings, educational gatherings, and any other event at which a reasonable number of women will be present. It can be used as a gift or as a conversation starter. This charming flier pictures five praying children with the Golden Rule from five different religions written in Spanish. On the back is a graphic of the sun with moons and the names of the prophets and the phrase "Prophets are like the moon, reflecting the light of God" in Spanish. This is the only product we currently carry using this design.